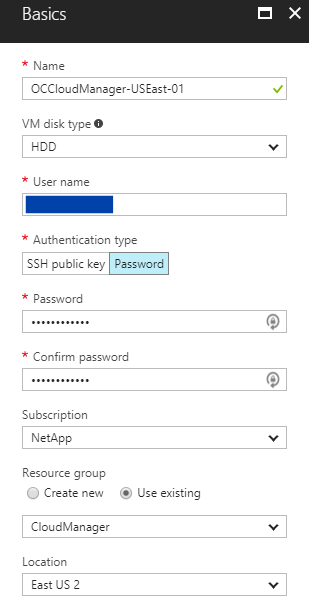 Welcome to my quick guide on deploying NetApp’s ONTAP Cloud into Azure. Before starting I recommend watching this quick video from NetApp which runs through the deployment process. It’s pretty quick, does a great job at summarizing the process, but leaves out some of the important steps covered in this guide. Ensure your Azure environment meets security best practices. Secure your cloud! 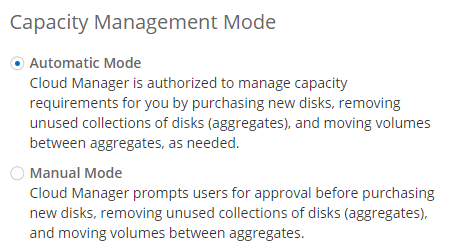 The crux of this step, however, is granting permissions so that Cloud Manager can do its thing. This involves setting up a service principal in Azure AD and obtaining credentials. You’ll also have to save a few strings of data throughout this process. Before getting started I highly recommend you read the following documents from NetApp. For the purpose of this guide I assume that your Azure foundation is solid as just jumping right in can lead to all kinds of issues later on. 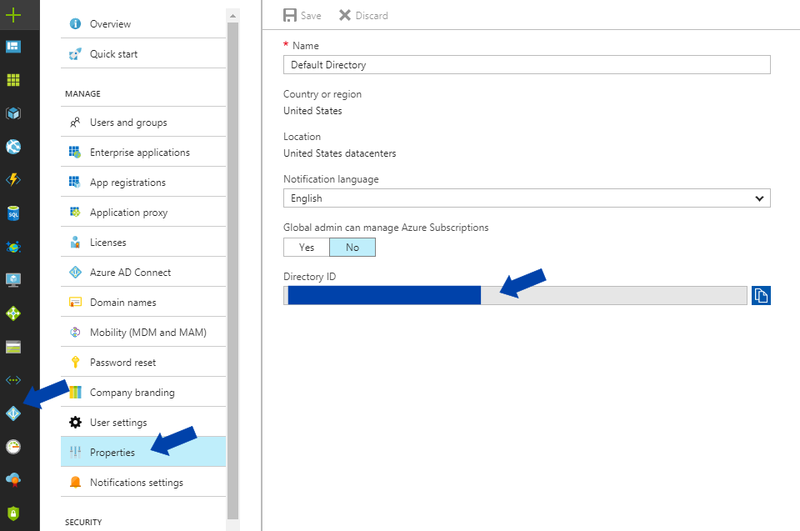 Step 1.2 – Modify the JSON file with the relevant Azure subscription information. 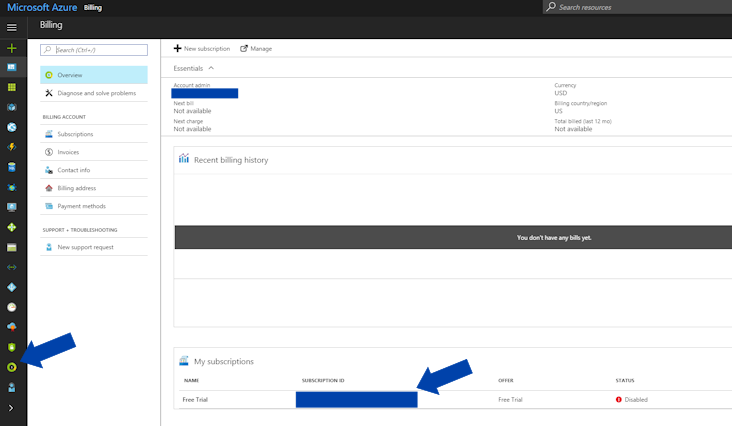 In the Azure portal, navigate to Billing > Overview and look for subscription ID. Copy this for the next step. 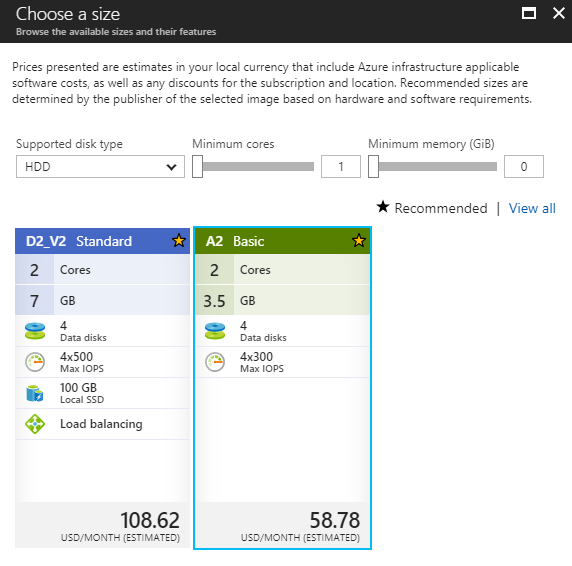 Repeat for any relevant Azure subscription. 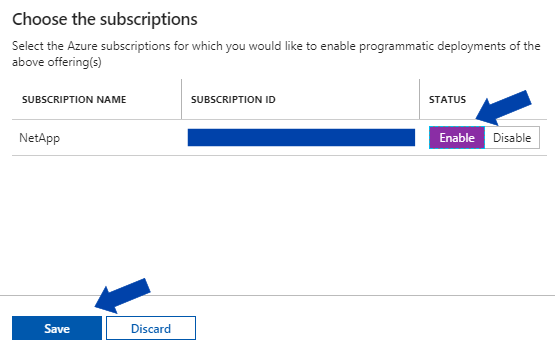 Step 1.3 – Update the previously downloaded JSON file with the Azure subscription IDs. If you’re unfamiliar with JSON script you can check your changes by plugging the whole content of the file into a validation tool like JSONLint for a quick check up. 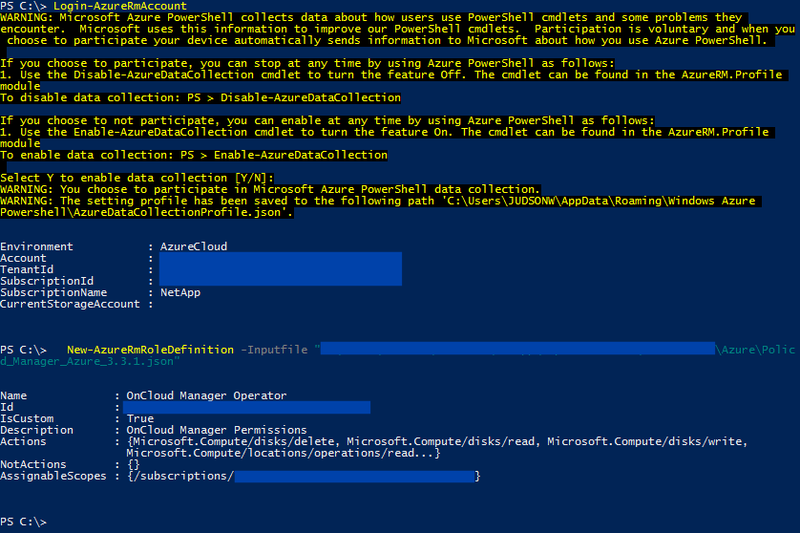 Using PowerShell, run Login-AzureRmAccount (this requires the Azure Cmdlets Module which you can download here (Command-Line Tools > PowerShell)). If you don’t have access to PowerShell you can leverage Azure CLI which is demonstrated on the above video. If successful you’ll see that the OnCloud Manager Operator role has been created. In the Azure console, go to Active Directory > App Registrations. In this section click Add, then enter a friendly name, keep the application type as Web app/API, and enter http://url as the sing-on URL. Save the Application ID for later. When you get to the Add API access pane, start with Select an API and choose Windows Azure Service Management API. On the next section select Access Azure Service Management as organization users (preview). Head back and click Keys. Enter a name, an expiration date, then click save. An API key will be generated, save this key! You won’t be able to view this later. Return to the Active Directory section, go to properties, and save the Directory ID. This value will be used as the “Tenant ID” later on during the setup. On the left hand size select Subscriptions. NetApp’s documentation has a key, I have what looks like a fax machine, and I had to search through the menu options to find it. Save the Subscription ID, you’ll need that later to log in programmatically. While in the Subscription section, select the Subscription > Access Control (IAM). Click add, then from the next pane, select the OnCloud Manager Operator role and the member you created earlier (type to search, scrolling won’t work). Click Save. While we’re at it, let’s configure progammatic deployment. From the market place search for NetApp or ONTAP Cloud. Select one of the results, and all the way at the bottom select “Want to deploy programmatically? Get Started” Click that and on the next window click enable and save. Repeat for each of the steps. Did you record the Application ID, the API key, Directory ID, and subscription ID? If so you’re good to go to Step 2, the installation of OnCommand Cloud Manager. 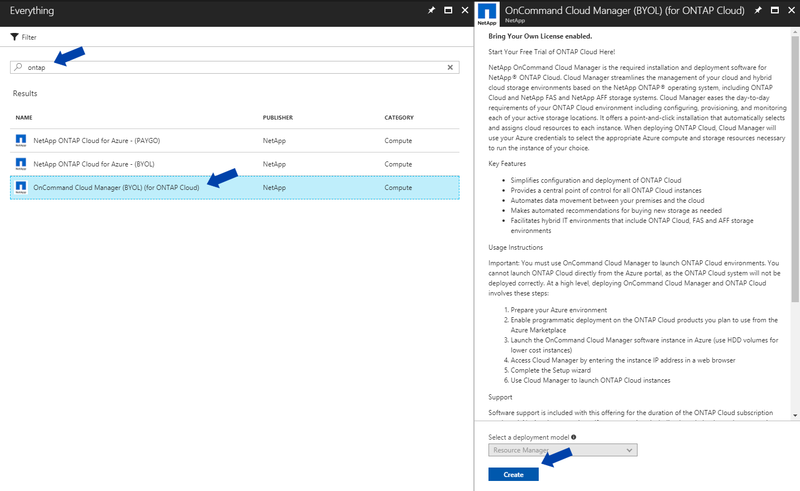 Once you’ve got Azure all set, it’s time to deploy OnCommand Cloud Manager. Log into your Azure environment and find OnCommand Cloud Manager in the market place. You can usually find it quickly by searching for “ONTAP” or “NetApp.” Click create to start virtual machine deployment. OnCommand Cloud Manager is currently supported on instance types A2, D1, D2, D1_v2, and D2_v2. Options are likely to vary per region. Consult with your Azure administrator to determine the best network location for this system. If everything looks good, hit purchase and continue. See that hourly cost from NetApp? That’s right, OnCommand Cloud Manager is free to use (well, you still have to pay Microsoft to run it in Azure). Validate can take 5-10 minutes. Once it completes enter the public IP address into your browser to for the final config steps. Build out the appropriate VNet for each working environment per your organization’s practices (since my test environment is pretty basic I placed it in the same VNet set up during the Cloud Manager install). 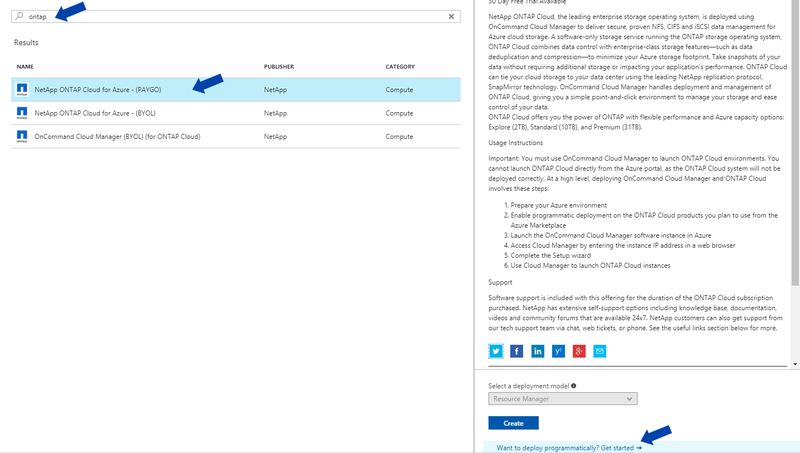 Note that the OnCommand Cloud Manager instance will need network connectivity to the target VNet and the ONTAP Cloud VM will need outbound internet access (namely for licensing and support services). You don’t need to configure a new security group, the deployment wizard will take care of that for you. Azure networking requirements can be found here and the security group rules can be found here. It’s also important to understand the licensing model and underlying VM sizes. You’ll need to know this during the provisioning process so now’s a good time to plan if you haven’t already. You can read more about the licensing and sizes here. You’ll also be asked whether you want Premium Storage or Standard Storage, essentially SSD vs. HDD storage. Oh, of course there are different costs associated which you can read about here, along with the throughput per disk numbers. In Cloud Manager go to Working Environments and select Add Environment. While you can deploy AWS instances from an Azure based OnCommand Cloud Manager, I’m only going to cover the Azure side in this article.